We have confidential information that we cannot throw away. It is mixed up and in the garage or loft and will be a challenge to our little shredder, so what could Citrus offer me? Citrus is pleased to provide you with an alternative to spending valuable time to securely destroy large or small amounts of archive documents that clutter up storage space at home. To safeguard personal information and prevent I.D. theft, our friendly team can arrange delivery of the appropriate number of our robust, re-usable 150 x 80cm 12 kilo sacks that you can simply fill at your leisure and arrange for us to collect when you are ready. We have a lot of paperwork which contains personal information and sensitive data and would like to recycle the paperwork but we don’t want our personal information to fall into the hands of somebody who might use it criminally for identity theft. 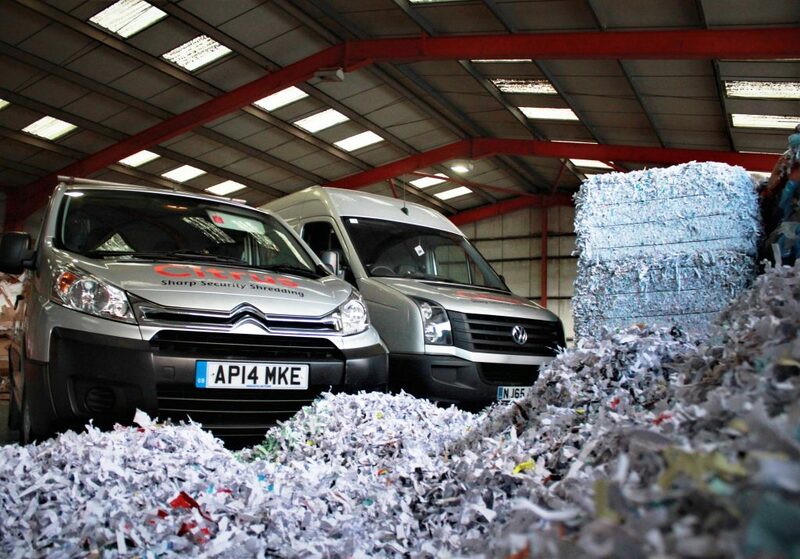 Citrus Shredding is pleased to provide you with an alternative to just burning paperwork in order to avoid this. Many people are becoming increasingly aware of and concerned with the environmental issues involved with recycling items rather than disposing or destroying them. To safeguard personal information and prevent I.D. theft, our friendly team can arrange delivery of the appropriate number of our robust, re-usable 150 x 80cm 12 kilo sacks that you can simply fill at your leisure and arrange for us to collect when you are ready. Your confidential paperwork will be shredded within 48 hours of collection and once shredded, you will receive a Certificate of Destruction. The shredded documents are baled and collected for transportation to a paper mill for complete processing and recycling. Other companies have told me I need to take out staples, clips and coloured paper, Is this necessary? NO! This will still be wasting your valuable time! 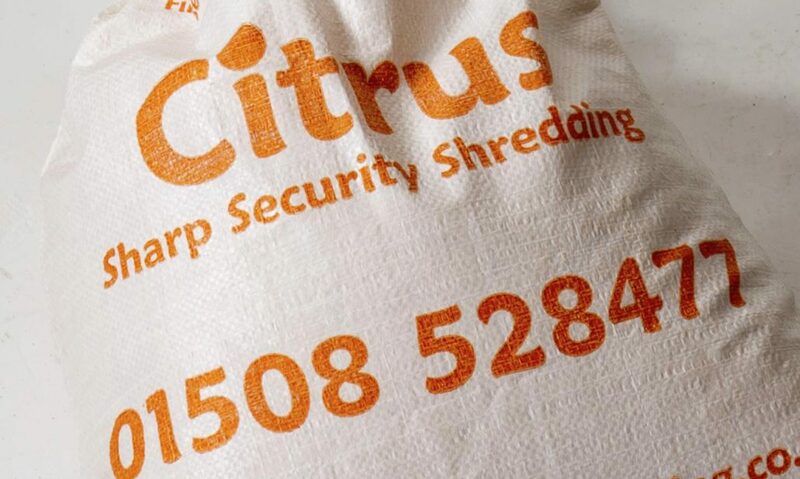 Citrus accepts cardboard dividers, files, folders, staples or clips as these are removed & separated for 100% recycling in our data shredding facility. 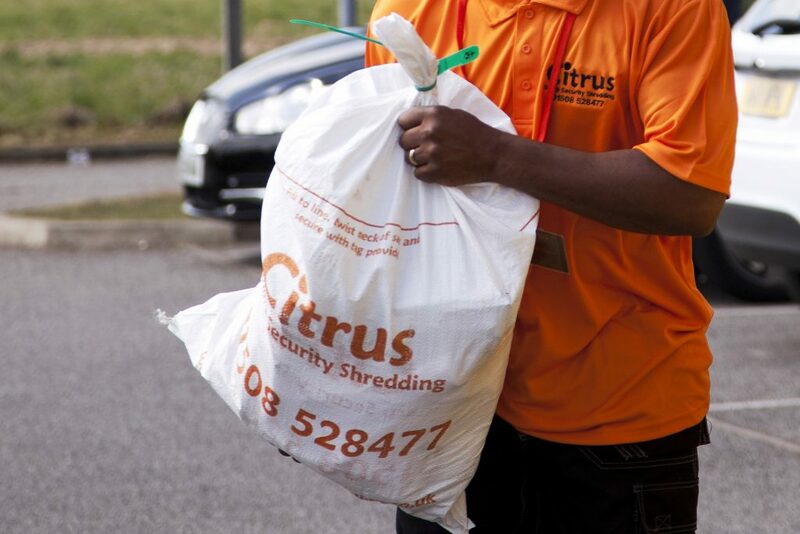 Citrus understands that your time is important and waiting around for hours for a collection can be really annoying! With this in mind, our aim is to provide a collection date and time slot so that you can get on with your life. When our security-vetted operative arrives, he or she will collect from anywhere you ask and will provide you with a detailed legally binding consignment receipt and Duty of Care service promise, providing you with an extra level of security and complete peace of mind. Your confidential paperwork will be shredded within 48 hours of collection and once shredded, you will receive a Certificate of Destruction. The shredded documents are baled and collected for transportation to a paper mill for complete processing and recycling. Citrus will supply you with a service invoice following collection and accept direct bank transfers and cheques.